A character end of terrace cottage being part of the conversion of the original village school situated in a desirable semi-rural location on the Surrey/West Sussex border. 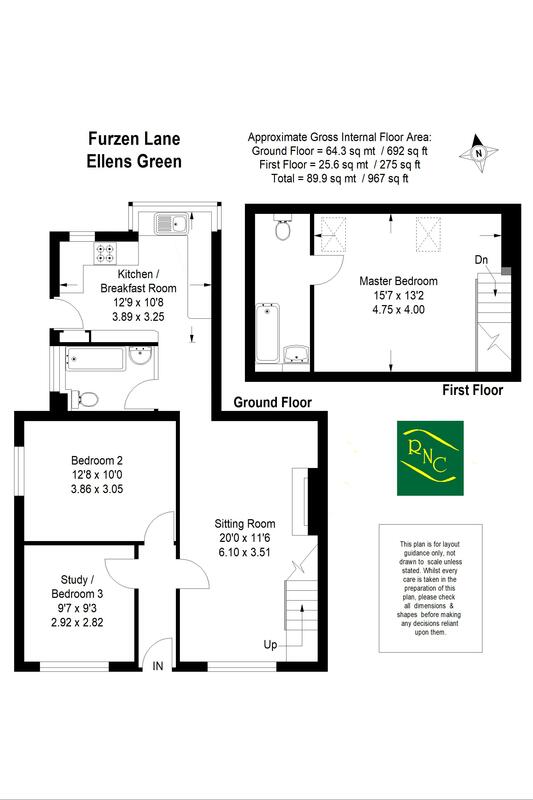 The property benefits from an adaptable arrangement of accommodation, having a good size living room with open fire, recently refitted modern kitchen/breakfast room and two bedrooms and bathroom on the ground floor and an impressive master bedroom with vaulted ceiling on the first floor with en-suite bathroom. The property features wood block flooring in the main reception area and ground floor bedrooms, replacement double glazing throughout and a recently installed new gas fired boiler. Outside there is a pretty cottage garden with lawns and well stocked flower borders, off road parking and a most useful home office/studio with power and light point. We highly recommendation a visit to fully appreciate the accommodation on offer. From our office turn left into the High Street and proceed to the second mini roundabout. Continue straight over into the Horsham Road and follow the road for a couple of miles to Ellens Green. Take the next turning left into Furzen Lane and 3 The School House will be found after a short distance on the left hand side. Turn left into the parking area and the driveway can be found on the right hand side. A lovely room with open fireplace with stone hearth and surround with timber mantle over. Herringbone wood block flooring, coved ceilings. Recently refitted with modern units under extensive beach block work tops with comprehensive range of cupdboards and drawers under. Stainless steel one and a half bowl sink with mixer tap. Four ring gas hob with oven under and extractor over, space and plumbing for washing machine and dishwasher. Space for tall fridge/freezer, Recessed downlighters. Back door to garden. Double bedroom, wood block flooring. Fitted with white suite comprising; panelled bath with mixer tap and shower attachment, pedestal wash hand basin, close coupled WC, part tiled walls, ceramic tiled flooring, low voltage down-lighters. An impressive room with vaulted ceiling. Fitted with white suite comprising; panelled bath with mixer tap and shower attachment, pedestal wash hand basin, close coupled WC, part tiled walls, ceramic tiled floor. There is an open plan front garden with well stocked flower and shrub borders, with path leading to front door. Side access to rear garden with well stocked flower and shrub borders, paved patio areas borded by gravelled path stepping onto shaped lawns leading to the parking and turning area. There is a brick built outbuilding. With power and light at the foot of the garden.